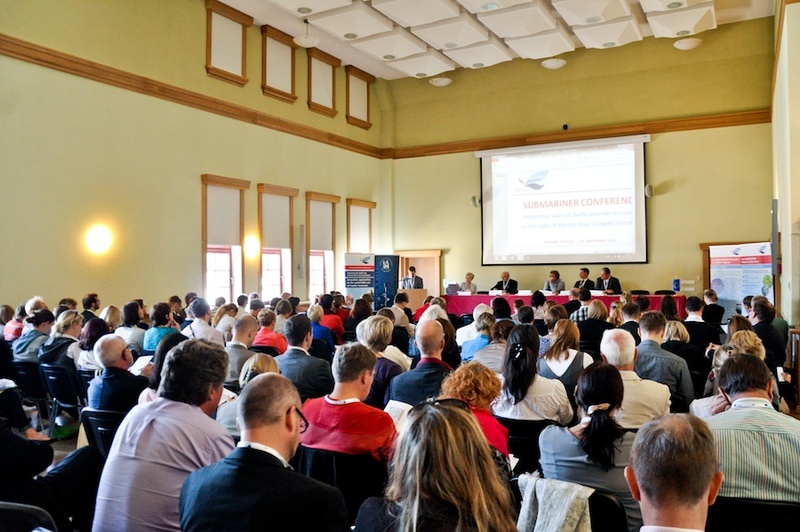 The Final Conference of the current SUBMARINER project was held in the Polish Baltic Philharmonic in Gdańsk, Poland on 5 and 6 September 2013, under the patronage of the Polish Ministry of Transport, Construction and Maritime Economy. 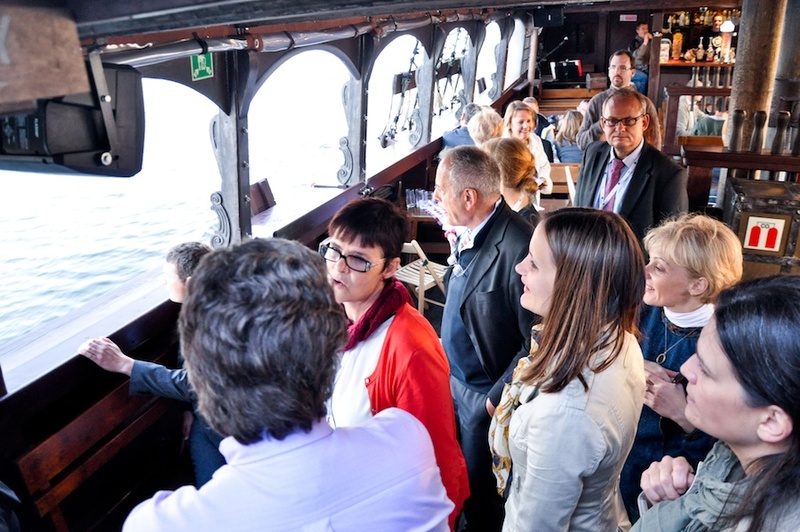 The event brought together more than 150 participants – high-level policy makers and representatives of companies and research institutions dealing with new marine uses around the Baltic Sea Region. The conference was marked by the presentation of the SUBMARINER Roadmap and the official launch of the SUBMARINER Network. 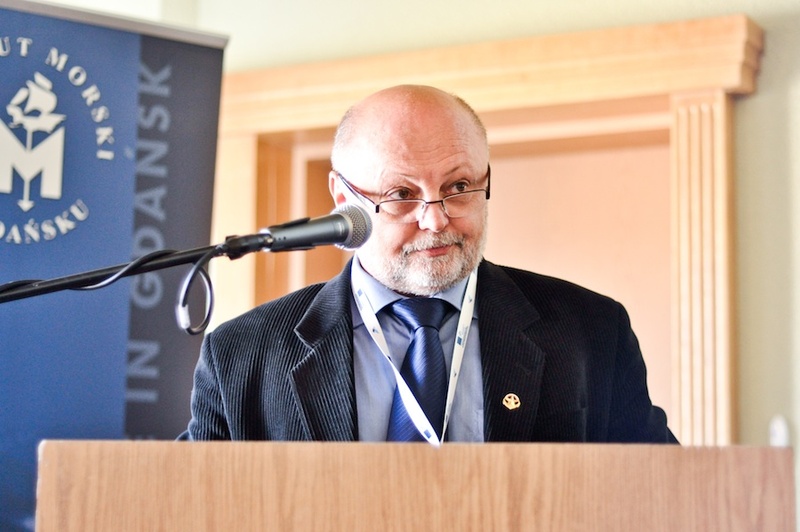 Benedykt Hac, head of Department of Operational Oceanography at the Maritime Institute in Gdańsk, opened the conference and welcomed the participants to Gdańsk. He pointed out that the event was not only the final conference of the SUBMARINER project, but at the same time the starting point for the SUBMARINER Network. 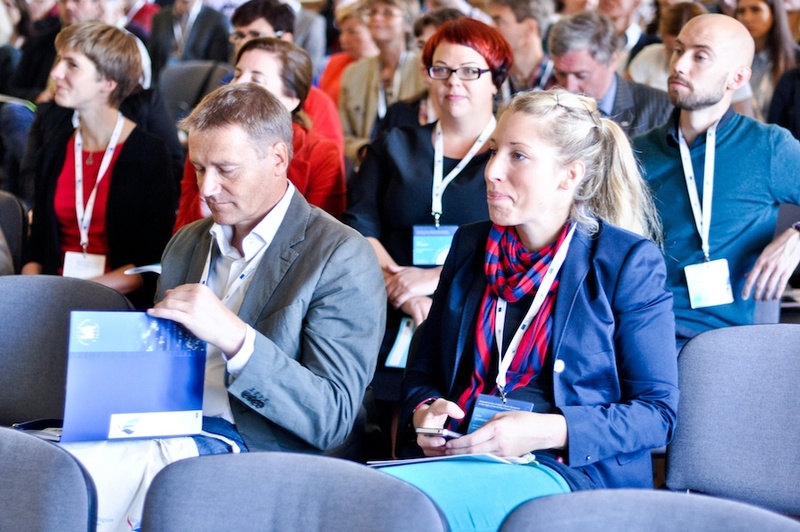 Based on the SUBMARINER Roadmap and its Network Action Plan, the Network will guide all Baltic Sea Region (BSR) actors dealing with innovative uses of marine resources and thus contribute to smart, sustainable and inclusive blue growth in the region. In his welcome speech, Maciej Styczyński Head of Maritime Policy Unit at the Polish Ministry of Transport, Construction and Maritime Economy stressed that Poland sees innovation as a core element of the maritime sectors and the European Blue Growth initiative. 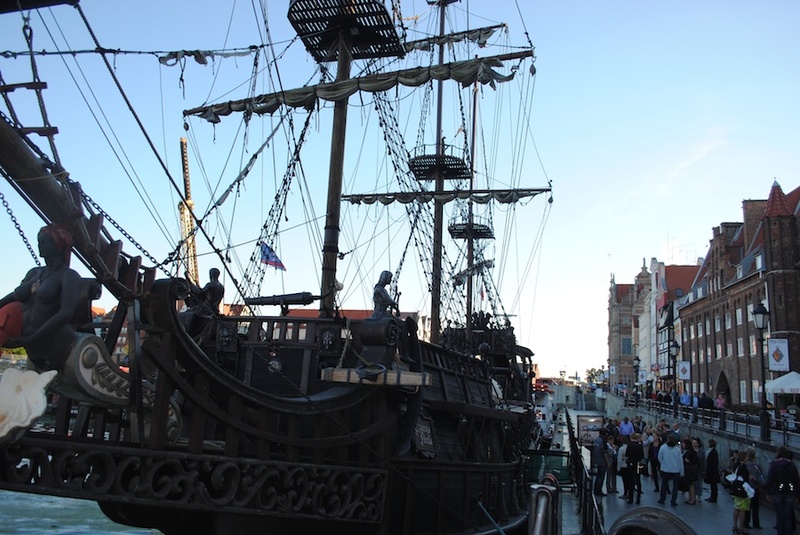 Poland focuses mainly on blue energy as well as maritime research and innovation in its maritime policy. Fredrik Gröndahl, associate professor at the Royal Institute of Technology (KTH) in Sweden, presented the SUBMARINER perspectives on innovative uses of Baltic marine resources. He sees SUBMARINER as a forerunner of the European bio-economy discussions which the project has already had some influence on. His summary of the scope of SUBMARINER uses is that many marine resources have the potential to turn problems into solutions. A business perspective on innovative marine uses was introduced by Udo Friedrich, Global Portfolio Leader Technology and Innovation with DuPont Nutrition & Health. He presented some examples of marine biotechnology applied by DuPont in industrial processes in food production. In his outlook, he stressed that the oceans’ unknown biodiversity still offers a large potential for future applications. At the same time, our understanding of the role of marine biotechnology role with regards to global challenges needs to be deepened. 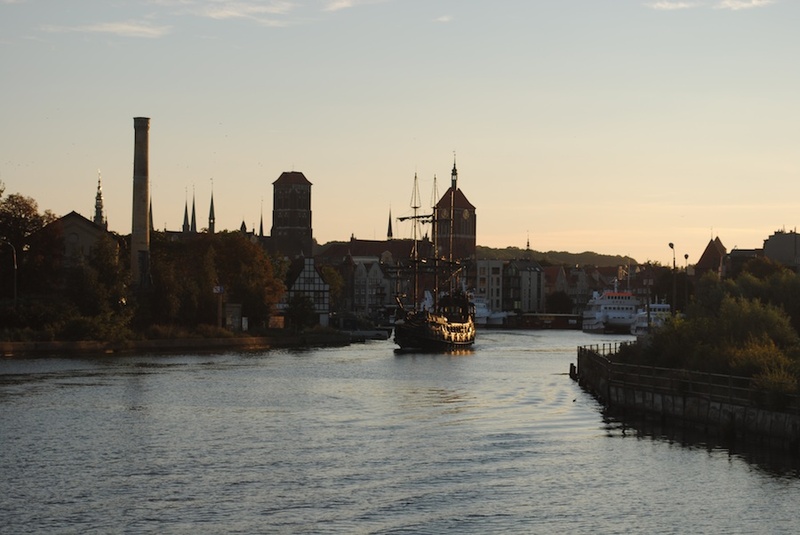 One of the regions within the BSR that aim to be a maritime model region is Schleswig-Holstein in Northern Germany. Hartmut Euler, Head of Department in the Ministry of Economic Affairs, Employment, Transport and Technology Schleswig-Holstein (Germany), presented the Land’s initiative “Sea our Future”, its Maritime Action Plan as well as the regional Masterplan Marine Biotechnology that was developed within the scope of the SUBMARINER project and that shall be implemented starting in October 2013. Anders Alm, Head of Unit with the Swedish Ministry of the Environment, opened this session with a talk on possible win-win approaches and innovations in protecting and restoring the Baltic Sea’s marine environment. With a view to the poor state of the Baltic Sea, he stressed that complementary activities as proposed by SUBMARINER have to be pushed and accelerated. Also Monika Stankiewicz, Executive Secretary of HELCOM, sees the SUBMARINER approach as a positive example that could motivate and inspire countries seeking for new ways to recover the Baltic Sea. She pointed out that the sustainable use of marine goods and services for achieving or maintaining good environmental status is a good strategy, which HELCOM understands as support to sustainable growth in the BSR. With a pilot mussel cultivation run by the government, the Åland islands are clear forerunners when it comes to testing new nutrient abatement measures. The Åland Minister of Environment, Carina Aaltonen, sees the integration of mussel farms into fish farms – which are crucial for the economy of the sparsely populated archipelago – as a possible win-win. To make mussel farming profitable in the future, there is, however, the need to introduce nutrient compensation schemes. Heini Ahtiainen, Research Scientist at MTT Agrifood Finland, presented the results of local/regional ecosystem service valuation studies in the BSR. Some valuation knowledge is available, but the willingness to pay for ecosystem services varies largely between the BSR countries. Among the challenges for moving ahead with ecosystem service compensations are to decide which are the most important ecosystem services and which of them can be valued in monetary terms. What makes it so difficult to turn ecosystem services into real monetary values? Is the BSR a good place to invest? What is needed to move on with innovative uses of marine resources in the BSR? When it comes to introducing ecosystem service valuation and compensation mechanisms, the panellists agreed that the so-called polluter-pays-principle generally is a good approach, but one needs to be aware of the fact that it will take a long time to achieve the needed change in peoples’ minds. Will consumers really be willing to pay more for e.g. food if they know that it favours the environment? It was also noted that the scientific community is at the moment mostly interested in knowing how much the public values ecosystem services. The BSR is a good place to invest in the eyes of the biotechnology industry, not only because of its strength in research and development, but also because of good networks and an interesting mix of developed economies and economies with growth potential. further lobby for political support for innovative uses of marine resources. 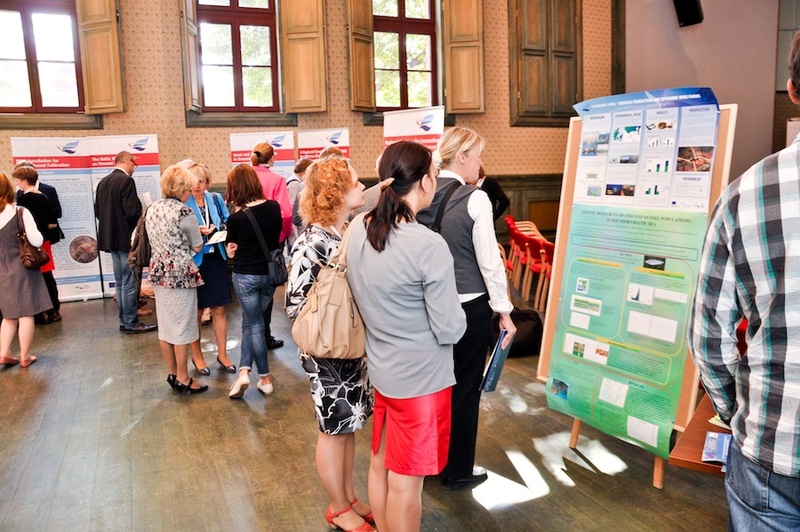 Download Presentations from the plenary session "Environmental benefits of and regional perspectives on new marine uses"
The session was moderated by Viktoria Voronova, lecturer in the Institute of Environmental Engeneering of the Tallinn University of Technology. She opened the session with an overview on SUBMARINER findings and planned activities in the SUBMARINER Network Action Fields “Data sets of Baltic Sea resources” and “Environmental Impacts on water quality and habitats”. Søren E. Larsen, professor and senior scientist at DTU Wind Energy, talked about wind and wave resource estimation in the BSR’s marine areas. Without wind there are no waves – the main idea is to combine wind and wave power plants in order to obtain necessary climate information, wave loads, service, and maintenance. To close existing knowledge gaps more information is needed, therefore small-scale pilots should be continued. The presentation by Manuel Frias from the HELCOM Secretariat was focused on data collection for the Bothnia Sea in the Plan Bothnia project. It was discovered that data was not detailed enough to map it. 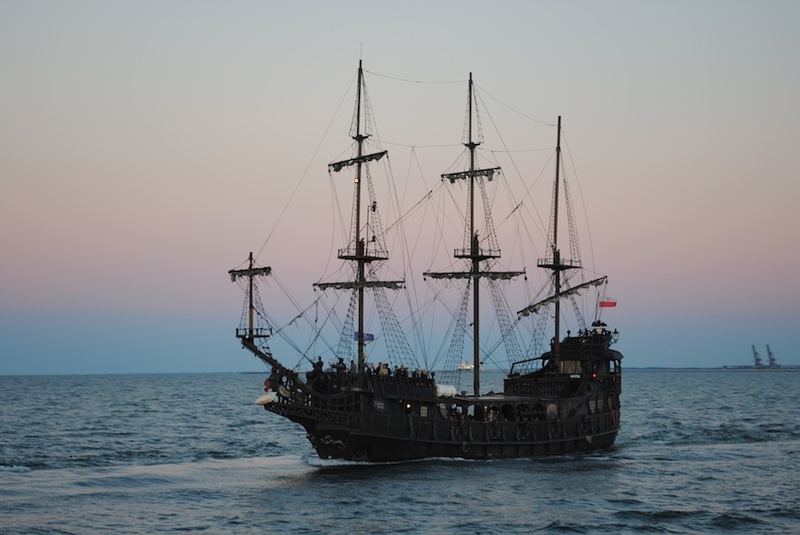 Therefore it was decided to create own data by working with groups of experts from sectors such as fishing or shipping. 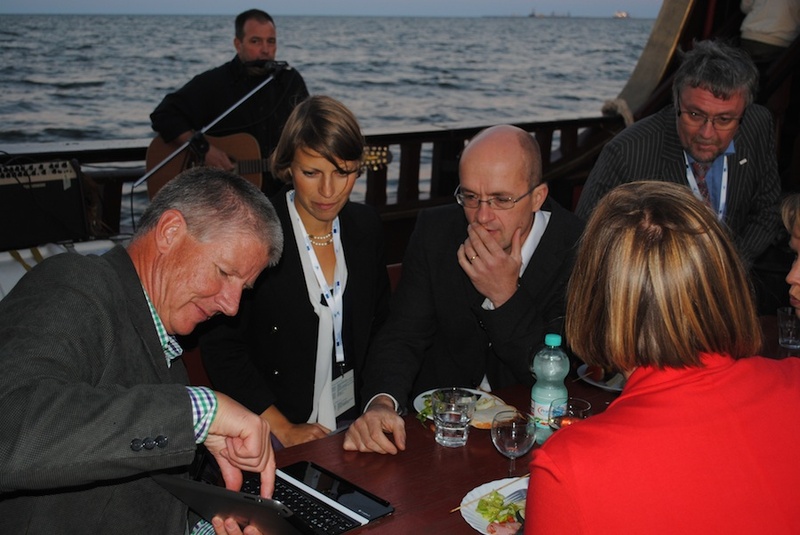 By this, the first pilot of maritime spatial planning was performed in the Baltic Sea. 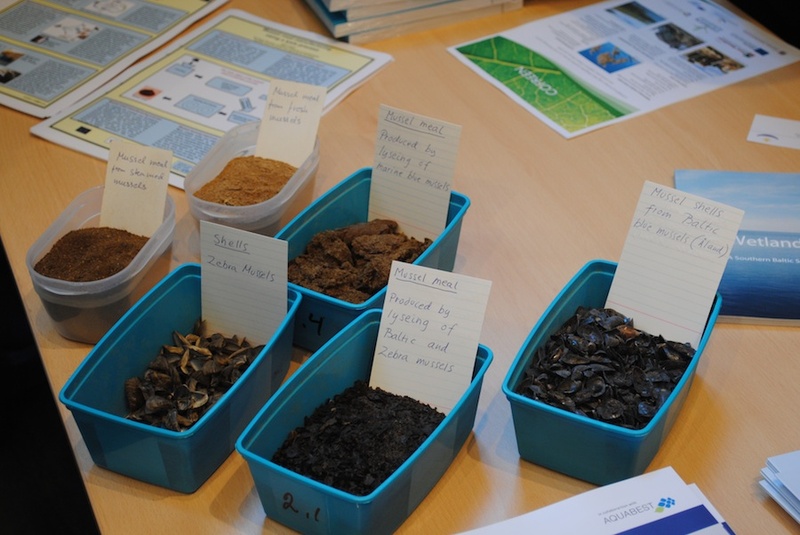 Christiane Fenske, biologist at the University of Greifswald, had a presentation about mussel cultivation in the Szczecin Lagoon. First experimental results showed that it is possible to achieve >20 kg/m² fresh mussel biomass after 15 months. During the cultivation process permanent monitoring is necessary. Pilot scale applications for mussel cultivation have to be continued to close existing knowledge gaps in mussel aquaculture. 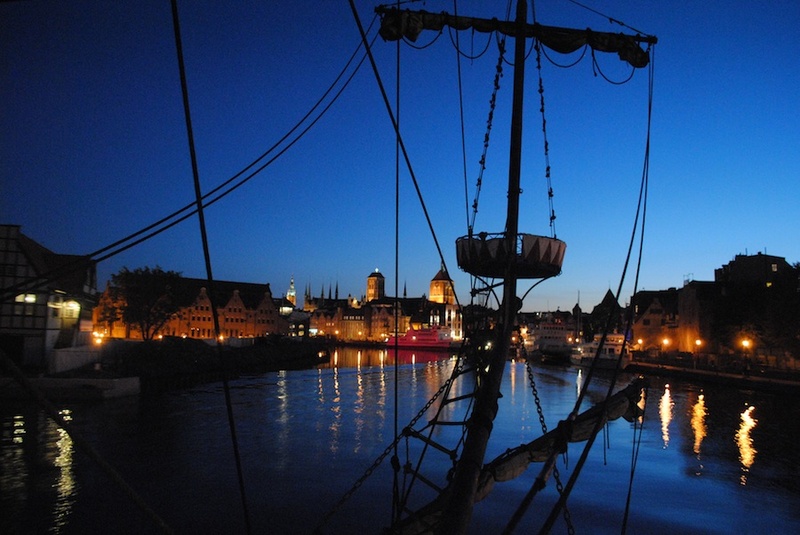 The environmental status of the Baltic Sea has still not improved as expected. Bronwyn Cahill, scientific consultant with Informus GmbH, has assessed if the new innovative uses will bring positive environmental effects. Results of the assessment showed that in some cases, new marine uses might have potentially negative effects on habitat and species protection. Therefore the location, spatial distribution, technology, time of harvesting etc. play a crucial role in usage of new marine resources. Pia Bro Christensen, project manager with Green Center, introduced the biorefinery concept and the SUBMARINER findings in the fields of bioenergy and biorefinery. There is a demand for energy, local products, high value products and sustainable feeds etc. The roadmap highlights necessary actions to reach goals on energy and biorefinery. Fredrik Gröndahl, associate professor at the Royal Institute of Technology (KTH), briefly introduced the session speakers. Emma Risén, PhD student at the Royal Institute of Technology (KTH), presented an assessment of biomethane production from maritime common reed based on a case study in Kalmar. Biogas was upgraded to fuel (biomethane) for the transport sector. A high energy input is required for biogas upgrading and harvest. All the reed in Kalmar only corresponds to 1 % of the transport sector’s need. All P and 60 % N can be returned to arable land, GHG emissions can be reduced by 80%. Socio-economic aspects, ecological risks as well as harvest times need to be studied further. Jukka Seppälä, senior scientist at the Marine Research Centre of the Finnish Environment Institute (SYKE), talked about biofuels from microalgae. The potential to produce microalgae far exceeds land based plants. There are no large scale productions today. Oil from algae is today too expensive to use for energy/fuel. To make algae cultivation economically feasible it is necessary to get high value products and other ecoservices, and only have a second step of energy production – the biorefinery process. Biofuels from microalgae are high on the political wish list, there is research support but no holistic vision for algae in Europe or worldwide. We need pilot-scale implementation, new technical solutions, biological engineering, life cycle assessments and techno-economical models. 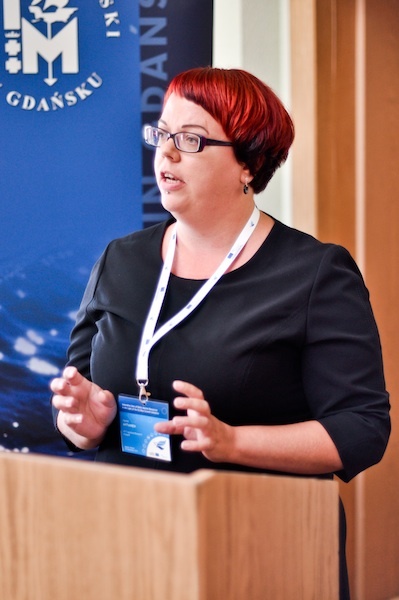 Ingrid Undeland, professor of Food Science at Chalmers University of Technology, asked “What’s beyond the fillets?” in her presentation on “Increasing the value of fish landings –thoughts on a Baltic fish based biorefinery”. Half of the landed fish in Sweden goes to human consumption, and only 50 % of this is filet sold. To increase the value of rest products enzymes, gelatine, oil, phospholipids, calcium concentrate and acids can be extracted. Dorsal muscles of the fish could be better used, e.g. filet, via pH shift. Marine protein isolates are widely used in food, but could potentially increase (e.g. compared to Japan). The value of landed fish could increase substantially. Would you earn more doing this? Yes, fishmeal is very cheap in comparison! Leo Christensen, Member of the Lolland Municipality City Council, held a presentation on “Biorefining – a necessary solution worldwide”. Produced energy must fit into the electricity and gas grids. Lolland exports clean energy. Using biomasses for heat is wrong, we need the fertilisers which are destroyed. Biorefinery should be brought into farming as a part of the local farming system. Local systems are necessary to achieve a positive energy balance. Waste water treatment is a big export for Denmark, which hinders development in the sector. Why biorefine? By ending fossil age we also need to end the petrochemical industrial age. We need to regain nutrients for recycling. Lars Nikolajsen, Head of Section for Marine Biomass at the Danish Technological Institute, presented the Macroalgae Biorefinery Project (MAB3). For a Danish bioethanol case study, a mussel production system was converted to cultivate brown algae in the Limfjord. 2 tonnes of macroalgae were harvested and treated. It is difficult to assess prices since production is so small. Make it also difficult to “sell” since you cannot approximate the price, they will use the cheapest. 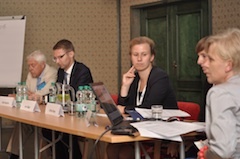 The session was moderated by Joanna Przedrzymirska, head of the Project management Centre in the Maritime Institute in Gdańsk. She opened the session with an overview on SUBMARINER findings and planned activities in the SUBMARINER Network Action Fields “Actors", "Finance" and "Pilot sites". Perspectives of financial support for investments in bio-economy were presented by Ulrike Klose, project manager in the Baltic Sea Region Programme 2007–2013 (BSR Programme) Joint Technical Secretariat and Ann Häger, Programme Manager at the Baltic Sea Unit of the Swedish Institute (SI). Ulrike gave an overview of investments in the current programme and reflected upon the lessons learned so far (transnational relevance, maturity of prior investment planning / too short implementation period, eligibility rules of the programme - ownership). She also informed about possible financing of bio-energy related projects under BSR Programme in the future by presenting a state of play of the 2014–2020 programme development. Ann presented the types of funding the SI offers: Seed funding, Thematic partnerships, scholarships as well as applicable rules for getting finances from SI. Christina Parkhomenko - Project Coordinator in the Nordic Council of Ministers‘ Information Office in Kaliningrad presented activities of NCM in the Kalinigrad Region indicating their important role in investigations of investment needs in the region. She also told about the ongoing bio-energy project aimed at strengthening and understanding of the idea among Russian stakeholders as well as fostering their involvement in this pan-Baltic process. 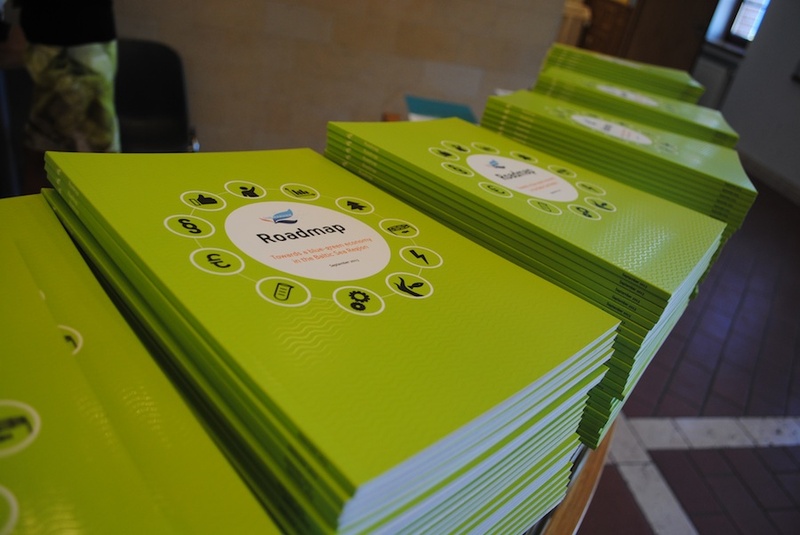 Practitioners‘ points of view on how to unlock investments were visualised by two case studies. Odd Lindahl, professor at the Royal Swedish Academy of Sciences, reflected upon his experience in small-scale mussel cultivation experiment. He pointed out two important aspects: timing and scale; indicating that an investment must last over time long enough to have a chance to be successful and stressing dependence of related costs on scale of a trial (e.g. type of vessels and related harbour infrastructure or time needed for harvesting). 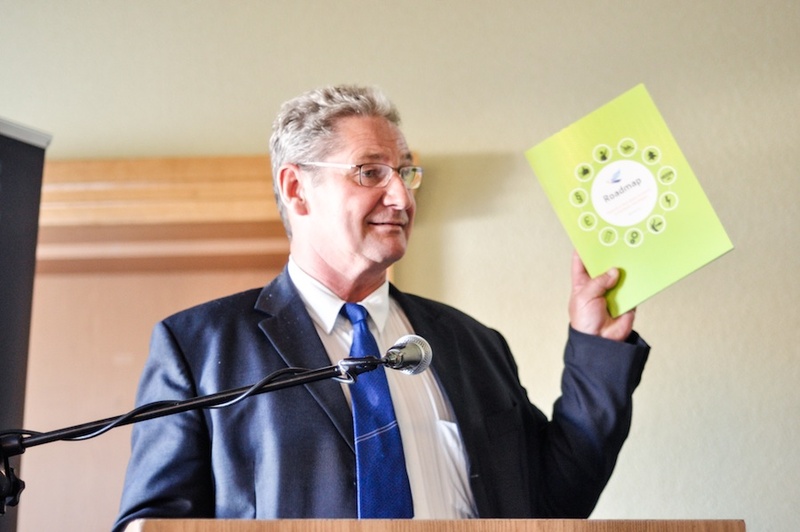 Kārlis Maulics, board chairman of the Environmental Development Association in Latvia, presented a development plan for the potential resumption of agar production from red algae Furcellaria in Latvia. He presented several scenarios from which the following conclusions enabling successful plan implementation have been drawn: there is a need to ensure cheap heat source in close vicinity to the production site, technological development is a must, local municipalities support is a crucial factor (many of them already understand potential benefit of agar production for regional development). 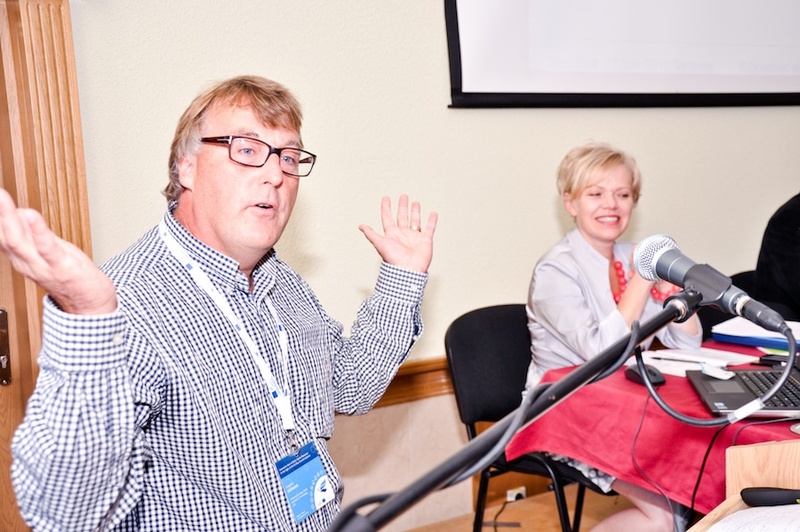 The session was moderated by Māris Vītiņš, honorary member of the Latvian Academy of Agricultural and Forestry Sciences. He opened the session with an overview on SUBMARINER findings and planned activities in the SUBMARINER Network Action Field “Create better legal and regulatory framework”. 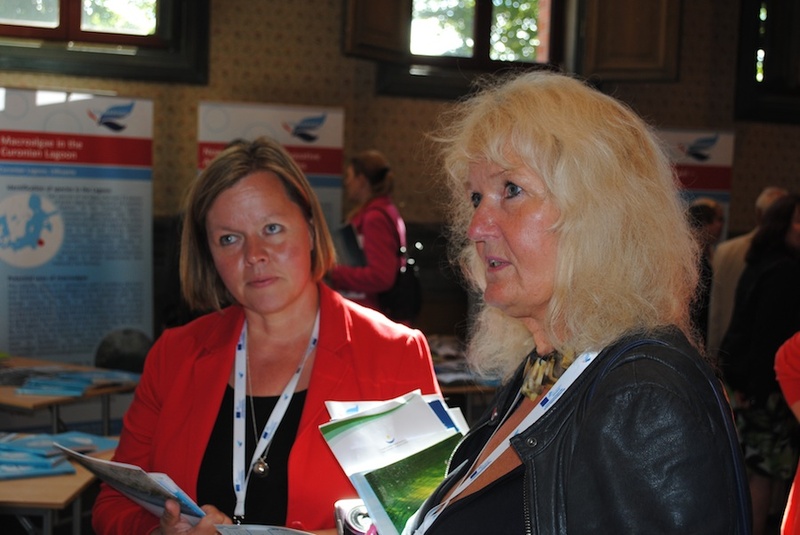 Petra Granholm (Government of Åland) talked about mariculture related legislative challenges on the Åland islands. She accented the importance of mariculture for employment of local society. Initiatives of AQUABEST project were introduced – the project is working to close the nutrient loop in fish farming by using Baltic Sea Fish Food and improving technologies and it was stated that modernising and harmonising the environmental legislation in similar ways in all BSR states is necessary. Ilze Rutkovska, senior officer with the Fishery Department of the Latvian Ministry of Agriculture, talked about previous experience of mariculture in Latvia and mentioned the new plans to build up to eight large-scale cages in Latvian waters. 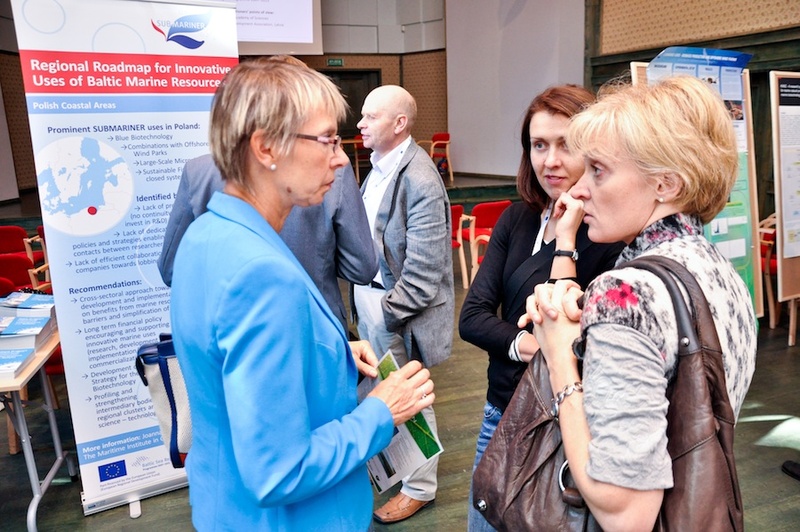 She also gave an overview of legislation regulating mariculture in Latvia. It was concluded that for development of fish farming in water of Latvia a time consuming and complicated procedure is required. 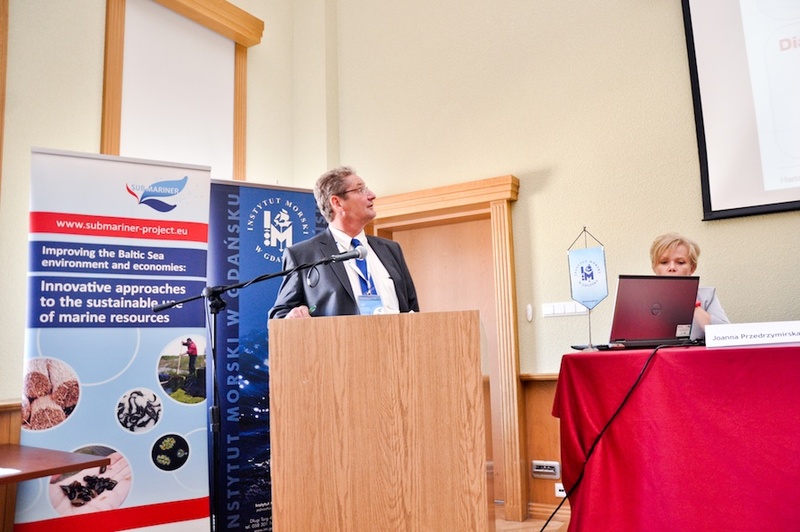 Arvo Iital, professor at the Department of Environmental Engineering of Tallinn University of Technology, introduced the audience with reed harvesting initiatives in Estonia and related legal issues. He presented various applications of reed and explained that reed has not been listed as a resource in legislation, which is why many uncertainties need to be overcome to use this resource. Jacek Zaucha, senior researcher with the Maritime Institute in Gdańsk, was talking about mariculture and spatial planning. He explained how detailed and all-inclusive the spatial planning must be and introduced VASAB-HELCOM Principles of spatial planning. He explained in detail that the most important principles are sustainability, pan-Baltic thinking, spatial efficiency and spatial connectivity. He also presented findings of the SUBMARINER project in relation to spatial planning. The session was moderated by Janka Clauder, counsellor to the German Federal Ministry of Environment, and Bronwyn Cahill, scientific consultant with Informus GmbH. They opened the session with an overview on SUBMARINER findings and planned activities in the SUBMARINER Network Action Field “Valuation and compensation of ecosystem services”. The first part of the session concentrated on policy objectives and instruments. It compromised presentations by Wera Leujak, scientific adviser with the German Federal Environment Agency, on a policy perspective on SUBMARINER new uses as well as Ing-Marie Gren, professor in environmental and resource economics at the Swedish University of Agricultural Sciences on policies for ecosystem services in the Baltic Sea. In the second part of the session, case studies were presented by Matilda Gradin (Trelleborg Municipality) and Nardine Stybel (EUCC-D, Coastal Union of Germany). Location, scale and timing of application are critical variables to be considered in the valuation of ecosystem services and the assessment of the real benefits of the application of a new use. Interdisciplinary dimension: Need to consider environment, economics, social and legislative issues as well as policies across land and sea. Cost-effectiveness of achieving Good Environmental Status: Need to consider cost-effectiveness of implementing nutrient reduction targets and best way to distribute the targets across Member States and sub-regions of the Baltic Sea in order to achieve Good Environmental Status. 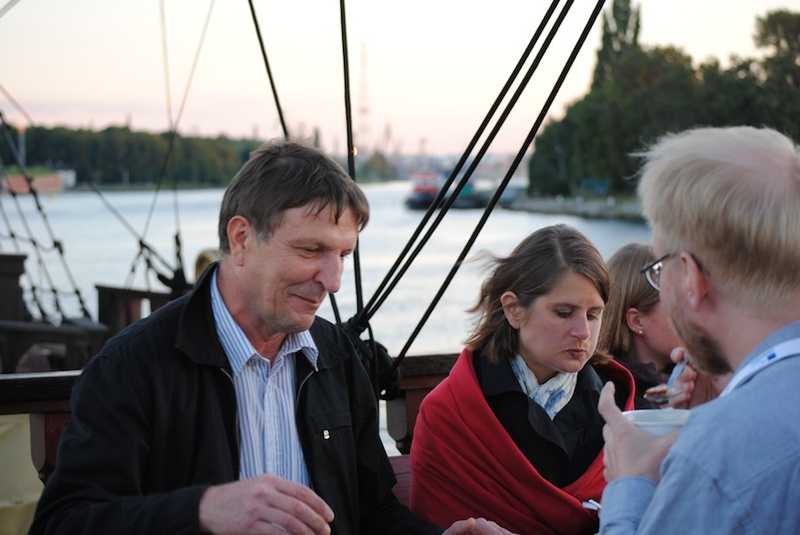 The session combined two SUBMARINER Network action fields: Pilot sites for empirical research and technology development and transfer, which were introduced to the participants by Kārlis Maulics, chairman of the board of the Latvian NGO Environmental Development Association. 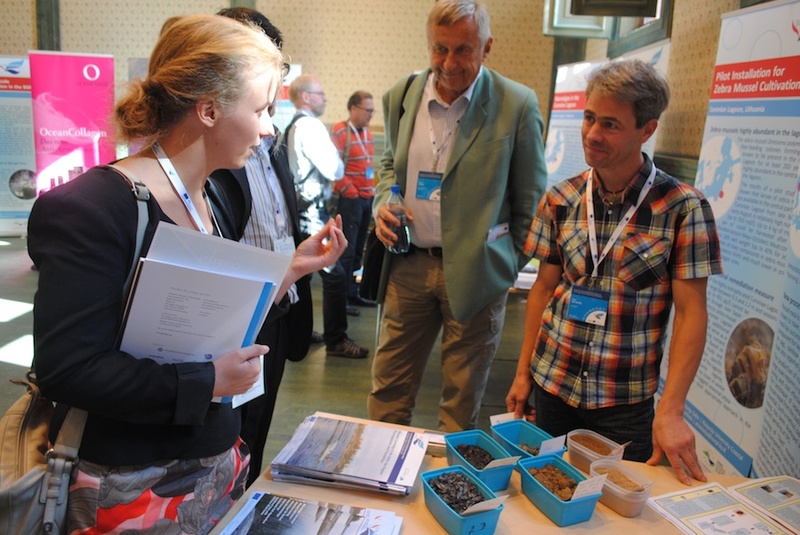 Odd Lindahl (Royal Swedish Academy of Sciences) presented a pilot plant for manufacturing mussel meal that was established within the SUBMARINER project. The plant has a capacity of 500 kg fresh mussel per 24h. The basic technique used for mussel meal manufacturing is a rotating drum dryer. Technological process faced problems as crushed mussel shells are extremely sticky and the end product contained a lot of shells, therefore a better technology was needed, involving steps such as dewatering and separation, heating and drying. Trials were also made with zebra mussels. The next step will be to scale up from pilot scale to a small factory of e.g. 10 tonnes/day. In his talk, Mads Van Deurs (Nordshell) focused on feasibility factors to be taken into account when aiming at culturing and harvesting mussels on a large and commercial scale: these include farm planning, the conditions in the Baltic Sea Region, the volume as well as environmental impact in terms of N & P. Success of large mussel farm depends on firstly feasibility analysis: calculation of a market demand, production price, expenses, technology and other factors. 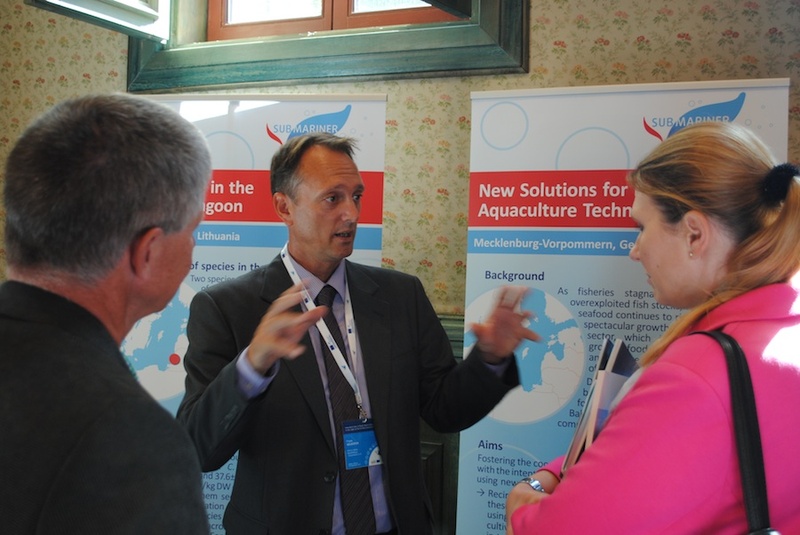 Bela H. Buck (Alfred Wegener Institute) talked about possibilities to upscale aquaculture, which requires a move offshore. IMTA concepts should form the basis for new enterprises to fulfil criteria of sustainability and environmental friendly techniques, which is crucial to gain acceptance. Multi-use will be accepted on a broader scale and would save costs due to quicker procedures, combined EIA, shared vessels/personal and training as well as additional biomass. Nerijus Blažauskas (Klaipeda University Costal Research and Planning Institute) presented the development and testing of a new concept of linear generator within the SUBMARINER project. This concept has proven that generation of electricity from waves is feasible at any scale and space within the Baltic Sea. It is even more attractive if combined with already existing facilities at the sea.At the large scale, waves can be the vast energy source for the offshore wind energy parks – using the same grid and energy accumulation facilities. At the small scale waves can be a supplementary energy source just near the end user for navigation buoys, oil platforms, sea bridges etc. In the introductory statement Dr. Imke Schneemann (Norgenta) gave a brief presentation on Blue Biotechnology in general. The high potential and first achievements as well as the results of the SUBMARINER Compendium and the recommendations given in the SUBMARINER Roadmap on this specific action field for the BSR were stressed. Professor Hanna Mazur-Marzec (University of Gdańsk) showed the university´s expertise in the field of Blue Biotechnology, e.g. by being partner of the EU FP7 project MAREX, and the effort to find new metabolites from marine cyanobacteria with a potential industrial and biomedical application. The University of Gdańsk supports the new project “Cyanobacterial oligopeptides” by the National Science Center Grant 2013-2016. Furthermore Prof. Mazur-Marzec pointed out the student course in blue biotechnology of microorganisms conducted by experts in biochemical ecology, molecular biology and medical chemistry in close cooperation with drug discovery oriented SME representatives. Dr. Jenny Veide Vilg (Chalmers University of Technology) talked about the recently formed SEAFARM project, developing a biorefinery for sustainable use of cultured seaweed. Focus will be on preservation of biomass and conversion of the algal carbohydrates into biochemical and biofuels. The algae group at Chalmers also runs projects on microalgae, such as simultaneous biomass production and purification of flue gas and sewage. Dr. Gerold Lukowski (Institute of Marine Biotechnology) demonstrated a new innovative approach to prevent the colonization of the skin by human pathogenic bacteria called MRSA (methicillin resistant Staphylococcus aureus), which is based on marine cyanobacteria producing bioactive compounds. The biomass was encapsulated by a novel technique in microparticles called Maresome® in order to improve the preventive activity and their bioavailability. A product for skin care and protection against MRSA was realized and represents a case study for a successful development of a biotechnological product from a marine organism. The Fraunhofer Research Institution for Marine Biotechnology EMB was introduced by Dr. Ronny Marquardt (Fraunhofer Research Institution for Marine Biotechnology) as a partner with great expertise in developing new technologies, such as processes and instruments in the fields of biological water quality monitoring, aquaculture technology, cellular technologies, homoeothermic and poikilothermic animal cell cultures, stem cell isolation and utilization, cellular test systems, online analysis of living cells and cell-based medical and laboratory techniques. 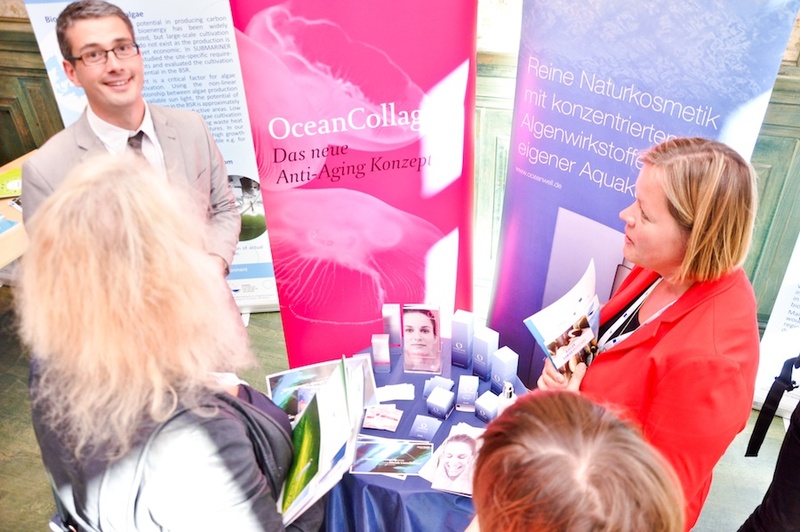 Dr. Antje Labes talked about the Kiel Centre for Marine Natural Product Research (KiWiZ) at GEOMAR (Germany), which is involved in national and international marine biotechnology activities. The centre focuses on the identification of new natural products from marine microorganisms and the evaluation of their potential for applications in medicine, cosmetics, agriculture, feed and food products. 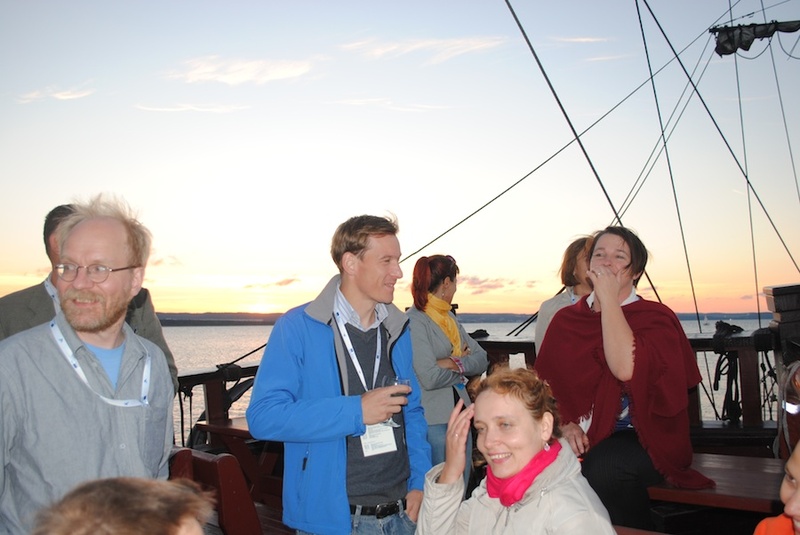 KiWiZ at GEOMAR is the coordinator of the EU FP7 project MARINE FUNGI aiming to discover new compounds from marine microorganisms for the treatment of cancer. 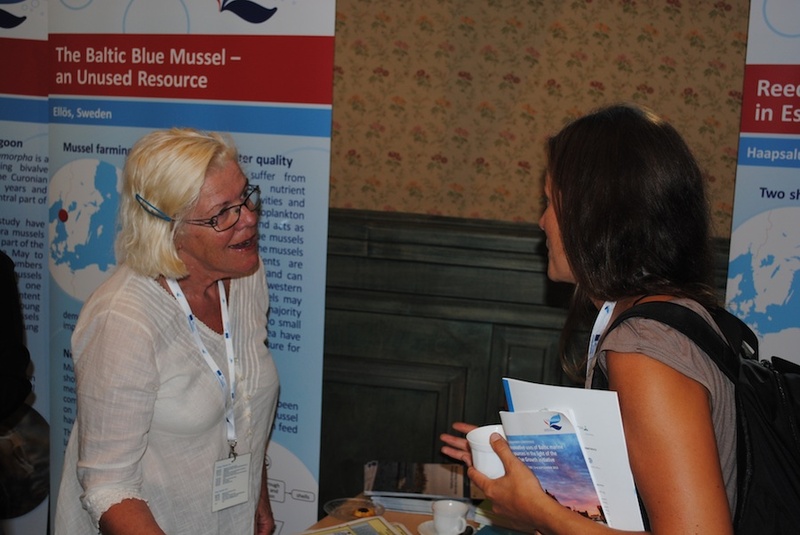 In addition Antje Labes presented the value chain for biotechnological products from marine resources. 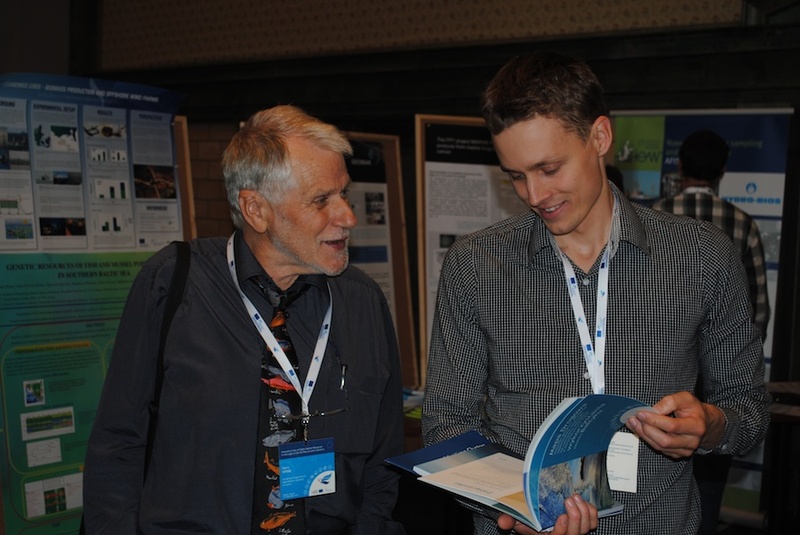 The session was chaired by Dr. Jutta Wiese (GEOMAR, Germany) and Dr. Imke Schneemann (Norgenta, Germany). The subsequent discussion showed that blue biotechnology has a high potential – not only due to a tremendous bio-diversity and first achievements, but also because of existing expertise and technique equipment. The discussants agreed that future partnerships should have in mind to group along the value chain and to work interdisciplinarily. In addition, financial aspects and ensuring the intellectual property (IP) have to be considered. Furthermore, promotion of blue biotech in general as well as raising awareness especially in companies having already the technical equipment should be done in the future. And it got clear that for interacting with each other, especially between academia and industry, clusters and networks are very helpful and important. The session was moderated by Angela Schultz-Zehden, managing director of s.Pro – sustainable projects and SUBMARINER project coordinator. She opened the session with an overview on SUBMARINER findings and planned activities in the SUBMARINER Network Action Field “Create positive image for products and services from marine resources”. Various new products for using reed as a construction material were shown by Mikhel Ling, managing director of the Estonian company Muhro Ltd.
Tim Staufenberger (oceanBASIS GmbH) presented the way from idea to product and into the market of the company oceanBASIS which uses marine resources for cosmetics. The presentation by Linus Hasselström, senior analyst at Enveco Environmental Economics Consultancy, touched upon the challenges to turn ecosystem service value creation into a price, which makes it difficult for private actors to actually see those public benefits. He pointed out that producers should compare their products’ competitiveness with the ones on a regular market and try to see how big the environmental benefits are. Governments, on the other hand, should determine which types of production should be supported and how. After having given an overview on existing macroregional and suprantational brands as well as branding efforts in the BSR, Marcus Andersson (Tendensor AB) tried to answer the question whether it is possible to brand the Baltic Sea Region as a region of Blue Growth. The unique selling point for the BSR might be the fact that there is a strong cooperation on blue growth issues, not so much the products and benefits as such. Leo Christensen, Member of the Lolland Municipality City Council, shared the experience of the Danish municipality Lolland in creating the image of a "green region". The keynote speaker Haitze Siemers, Head of Unit Maritime Policy Baltic and North Sea, DG MARE, presented the European Commission’s Blue Growth initiative, its five focus areas (tourism, ocean energy, aquaculture, blue biotechnology and seabed mining) and gave insight into current steps following from the initiative. Sea basin strategies have an important role in building the blue economy. 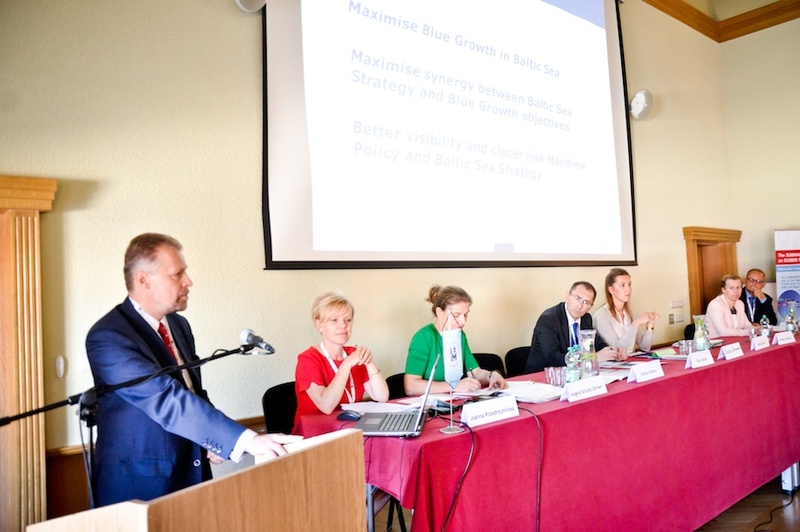 To maximise Blue Growth in the BSR, it is thus important to strengthen the maritime component of the EU Strategy for the Baltic Sea Region (EUSBSR) and to strengthen the links between maritime strategies and the EUSBSR. 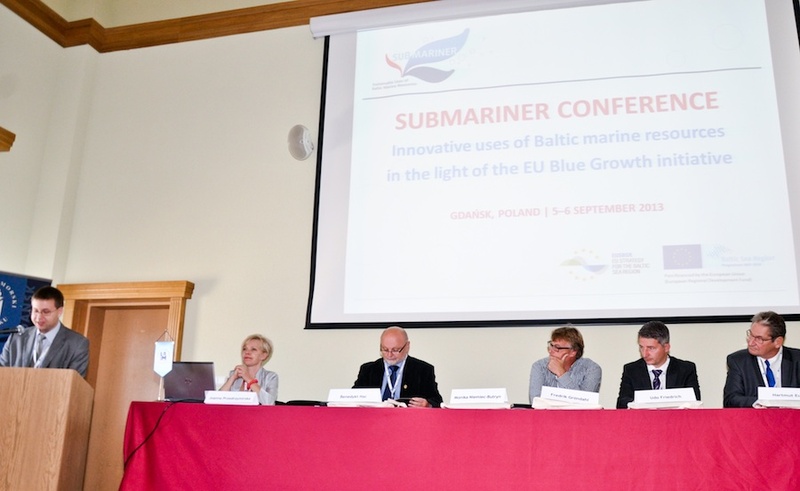 Following this keynote, SUBMARINER Lead Partner Joanna Przedrzymirska (The Maritime Institute in Gdańsk), presented the SUBMARINER Roadmap, which she sees as the BSR’s response to the European Blue Growth initiative, although the SUBMARINER topics are not a 100% match with the Blue Growth focus areas. The Roadmap and its Action Plan will also be the reference document for the SUBMARINER Network, guiding the future activities related to innovative uses of the Baltic Sea’s marine resources. Environmental assessments should be continued and adapted to local conditions. Interdisciplinary approaches involving environmental, economic, social and policy perspectives should be strengthened. To be able to continue from small-scale pilots to knowledge export and to overcome gaps in legislation, there is still a need for more pilot sites. The session’s participants agreed that the future belongs to biorefineries. Intellectual property issues remain high on the agenda. Relationships between public research and private companies should be further improved. Today’s costs are tomorrow’s benefits: there is a need for a stable legislative framework. Prerequisite for any awareness raising activity: the product has to be right! Unique selling points (USPs) have to be identified, the USP for the BSR might be the high level of cooperation. 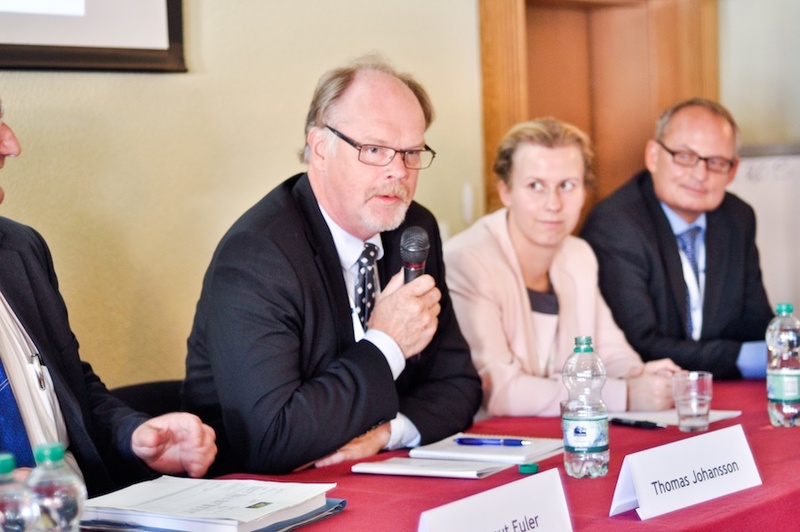 Panel Discussion: What is the role of the EU Strategy for the Baltic Sea Region in promoting SUBMARINER activities? 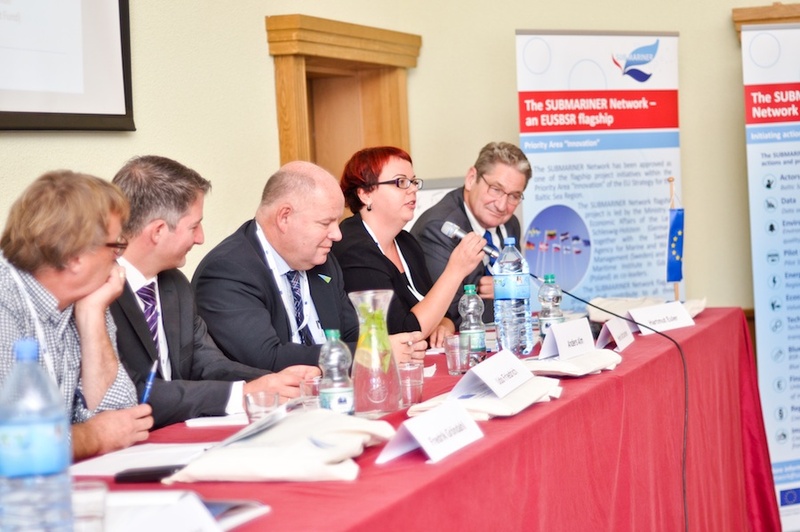 In the subsequent panel discussion moderated by SUBMARINER project coordinator Angela Schultz-Zehden (s.Pro – sustainable projects GmbH) possibilities to coordinate the activities of the SUBMARINER Network with other EUSBSR priority areas and horizontal actions were discussed. The head of the VASAB Secretariat Talis Linkaits, representing the EUSBSR horizontal action “Spatial”, stressed the importance of a wide stakeholder participation in spatial planning processes. A good possibility to do so is the dialogue series of the PartiSEApate project. 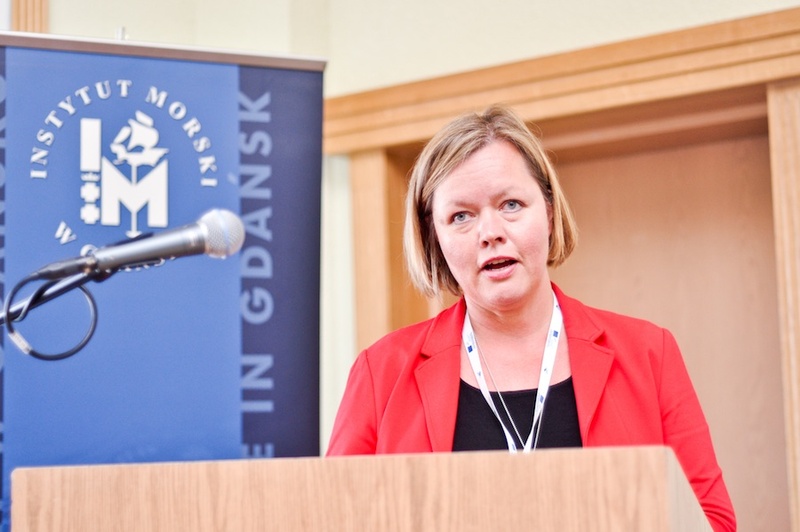 Christina Parkhomenko (Nordic Council of Ministers’ Information Office in Kaliningrad), representing the EUSBSR horizontal action “Bioeconomy”, underlined the interest of the Nordic Council of Ministers to join the SUBMARINER Network. She also stressed that a bioeconomy stakeholder conference to be held in Stockholm. Ulrike Klose, project officer at the Baltic Sea Region Programme 2007–2013, shared the current status of programming the new BSR Programme for the period 2014–2020. She sees the potential to fund some of the actions proposed in the SUBMARINER Roadmap under the priorities on sustainable management of natural resources as well the one on innovation and smart combinations. Peter Frank, General Secretary of ScanBalt and flagship project leader of ScanBalt Health Region stated that ScanBalt will be a supporting partner of the SUBMARINER Network. From his perspective, ScanBalt Health Region and the SUBMARINER Network will complement each other very well. 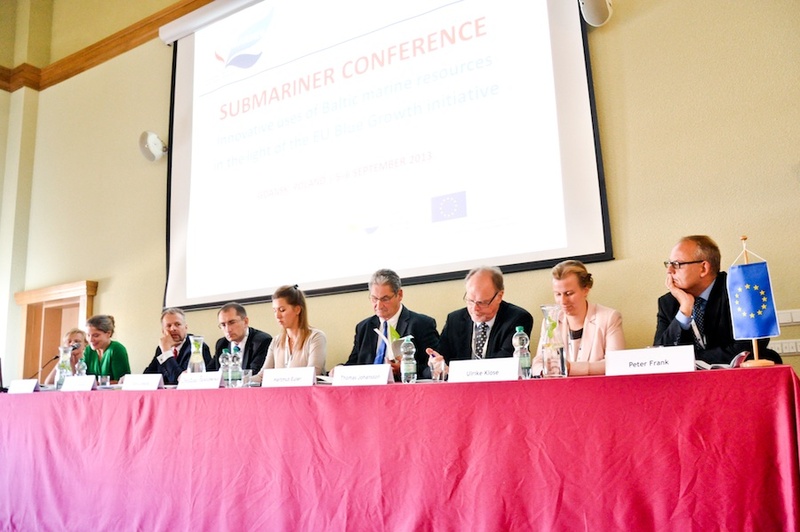 Haitze Siemers (DG MARE, European Commission), underlined that core elements of the Blue Growth initiative have been picked up very well by SUBMARINER, especially the aspects of innovation, of working together and of reinforcing sectors with potential. He welcomed that SUBMARINER will move forward from the project stage as the implementation of Blue Growth will require an appropriate legal environment. 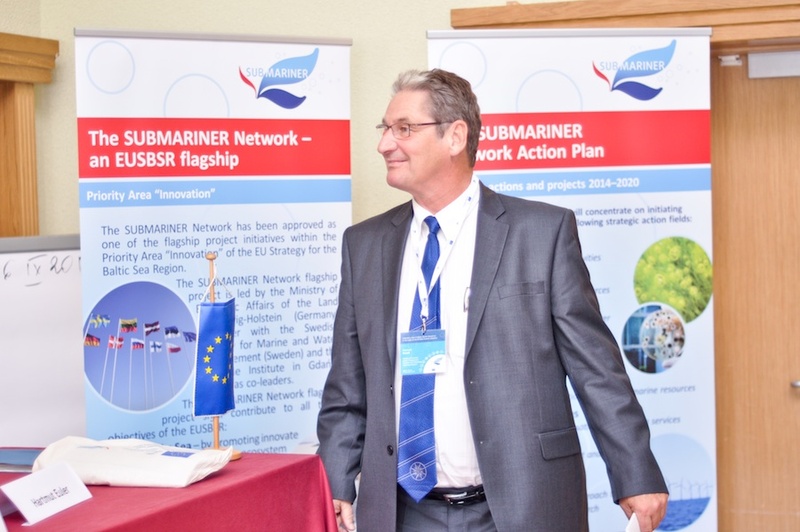 As the flagship project leaders of the SUBMARINER Network, Hartmut Euler (Ministry of Economic Affairs, Employment, Transport and Technology Schleswig-Holstein) and Thomas Johansson (Swedish Agency for Marine and Water Management) announced the launch of the SUBMARINER Network which will be committed to the implementation of the SUBMARINER Roadmap. As a legal body, a European Economic Interest Grouping (EEIG) shall be founded by the end of 2013. The Network will be coordinated by a Network Secretariat. Both Mr. Euler and Mr. Johansson stressed that stressed that real actions can only be achieved by a broad participation of various stakeholders from society, business and academia. They thus invited all interested stakeholders to join the SUBMARINER Network.